Żurrieq (Maltese: Iż-Żurrieq) is a town in the Southern Region of Malta. It is one of the oldest towns in the country, and it has a population of 11,823 inhabitants as of March 2014. The first documentation about it being a parish dates back to 1436 dedicated to St. Catherine of Alexandria. The island of Filfla is administratively a part of the town. The town stretches from In Nigret to Ħal Far respectively in old times the town was a border with Żejtun. There are a number of villages forming part of Żurrieq. The Village of Żurrieq claims for a large area of the South Eastern part of the Island of Malta, in which village we find a wide collection going back to the Bronze and Punic times, through the Roman, Knights and British eras. The village in itself is to a large extent adorned with houses and buildings of historical value dating to the 15th and 16th centuries. Numerous ruins and remaining structures indicate the flow of the village through the time. These indicate the various settlements of peoples that inhabited the village area, from the Phoenicians to the Carathaginians, Greeks to the Romans. The remains found indicate these peoples as ancestors to the village, yet without excluding the possibility of other peoples, this village is rich in ruins and remains which in future may shed new light on its ancestors. Proof of this may be seen namely in remains such as the Punic Tower, Xarolla Catacombs, Cart Ruts at 'Tal-Bakkari', 'Tal-Hlantun Tower' and many others. Żurrieq features a wide collection of ruins and remains dating back to the Bronze Age and Punic times, through the Roman, Knights and British eras. Structures dating back to the 15th and 16th century are scattered throughout the village. The ruins have characteristics which identify the various settlements of peoples that inhabited the village area — from the Phoenicians to the Carthaginians, Greeks to the Romans. Examples of such remains include the Punic Tower, Xarolla Catacombs, Cart Ruts at Tal-Baqqari, and Tal-Hlantun Tower. The village has a large number of chapels and historical places such as the Xarolla Windmill, Armery, Plazzo Ganbatist, Wardija Tower, Bubaqra Tower and many other places of interest. Żurrieq is also well known for the belvedere that overlooks the Blue Grotto (located in the confines of neighboring village of Qrendi) that can be found at the seaward end of the Wied Babu. In the village of Żurrieq, one will find various archaeological remains dating back from various periods. One of these early findings was discovered in 1885, in the land known as ta' Danieri limits of tal-Hlewwa. In this location Phoenician tombs were discovered containing the remains of three human skeletons and some pottery. On 1 August 1911, another tomb was found in the fields known as tal-Gharghariet limits of Nigret. In the area known as tal-Bakkari ruins were unearthed of a chapel, built on even older remains of what is thought to be a Roman temple. One should mention that in the same site, in 1921, pottery dating back to either Punic or Roman times was found in an underground cistern just under the ruins of the same chapel. Some relics were thought to be even of a former period, namely the Bronze Age. This would indicate that the same sight was used through the ages various peoples, though always for a spiritual purpose. One should also mention that a couple of metres from this sight, one will find the ruins of one of the towers which is referred to as Torri tal-Bakkari, which was constructed out of the same type and size of stone as those found in the chapel's ruins. On 6 September 1920, this tower was identified and compared with the ruins of two other towers partially standing and in a better preserved condition. The other two towers are known as tat-Torrijiet and tal-Gawhar situated in the areas known as ta' Wilga and tal-Hlantun respectively. There are still contestations to their exact period, yet features may lead one to associate the towers to Bronze or Punic times. All three towers are of a perfect round shape and made of the same type of large stones, typically used long before Roman time, which is the period given by some. This may be determined from near investigation on the site of tal-Gawhar, were various features in the stone can be observed, such as altar shapes, holes to contain liquid like those used for sacrifice of blood, and other holes which could be used to tie up animals near the same altar . In August 1926, a tomb was discovered near the Xarolla Windmill, and from further investigations done on the 6th of the same month, it was determined that the tomb had already been touched and relics taken away, but there were still some pottery dating back to 200 A.D. Today these Paleo-Christian tombs are being excavated to their full extent after adjacent tombs were discovered in 1995, which now indicates a burial area of a larger size which could only belong to a large settlement in the area. In these tombs, one may find very interesting architectural features rarely found in similar tombs on the island. The size of the area containing the tombs indicate that in the area, there has always been a considerably large community, a settlement marking the area in time. There is the possibility that a Roman road passes through the area which would link the settlement in a both to northwest and the south of the island. The same road may date even prior to Roman settlement and there are indications that the Halfar Dolmen, the towers at tal-Bakkari and tat-Torrijiet, the catacombs at tax-Xarolla, Hal Millieri and il-Mentna at Mqabba, are all on a perfect line. On 15 March 1930 a tomb was excavated containing human bones and Roman pottery dating to the 7th century B.C.. On 3 September 1935 in a field known as 'Ta' Farrat', near the Xarolla Windmill, a tomb was found dating to the periods of the Carthaginians and Phoenicians, containing as well Roman pottery remains. On 13 June 1930, a Roman tomb was uncovered in Hal Far in the area known as tal-Baqqari, another on 4 July 1956, and another on 5 March 1956, which were all excavated down in the rock and found containing Roman pottery of the third period. On 13 July 1938, Dun Gwann Farrugia asked the Museums authority to look into a building found in the gardens of the archpriest of Zurrieq. One will find reference to these remains in the book by J. Houel, Voyage Pittoresque de Sicile, Malte et Lipari. He claims that these remains date back to the Greek period. Unfortunately today only a small tower belonging to a larger building remains, known due to the actual dating of the same tower, as the Punic Tower. This tower is of great interest for the fact that punic remains on the island a scarce. The structure of the tower is made of stone cut in large perfectly square blocks and put together with great precision with the use of round dowels (mincotti) to hold the same blocks in place. According to Chev. Guze Galea 'in 1674, Grandmaster Nicolo Cottoner, built five windmills around Malta. One of these was the windmill built in Nigret, Zurrieq, known 'tal-Qaret'. After some time, in 1724, Grandmaster re-built another windmill next to it, known as ta' Marmara, which was the surname of the first person to work in the same windmill, Luret Marmara. The windmill known as tas-Salib, was built by the Gafa' family, and knows its name to the village cross situated just to the south west of the same windmill. Another windmill is that known as tax-Xarolla, was built by Grandmaster Manoel de Vilhena, in 1724. 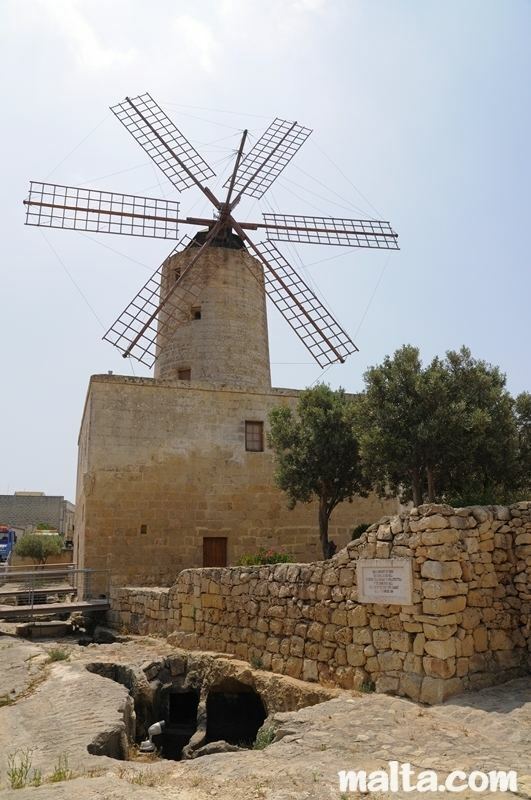 In 1992, this was restored to its original working order is now the only functioning windmill in the islands of Malta and Gozo. This is a valuable witness of local culture and heritage still has parts of the original mechanisms and can still grain the wheat. In the year 2000, this building was passed over to be administered by the Zurrieq Local Council and is intended to serve also as a cultural centre. Sacred Heart Of Jesus, celebrated in the Parish Church and also in Nigret. Soċjeta Mużikali Santa Katarina V.M. Borgo Maggiore in San Marino.